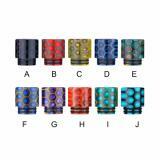 Sailing Resin 810 Drip Tips come with different color. But please notice that color is random. Just take it as your spare part. Sailing Resin 810 Drip Tips adopt high quality material to ensure comfortable tactile impression and thermal insulation. Color is random. Just take it as your spare parts. Sailing Resin 810 Drip Tips Random Color 1pc/pack is a cheap and high-quality 1pc/pack sailing color changing epoxy resin 810 mouthpiece drip tip for tfv8/tfv12 tanks sl208 810 drip tip for e cig. It is avalavle in different colors to suite you. Fits good and looks good for the price. Stylish design with different colors which may attract you. All over good item.